Eurostar at speed on the Viaduc de Cavaillon. This page describes most of the activities and required rolling stock for the LGV Med route. Rolling stock required in Wolfgang Plenz's activities is listed on the TGV series activities on LGV Med page. All these activities, including the activities installed as part of the LGV Med route installation, assume you've bought Clem Tillier's TGV Addon pack. At only $US7.95 (about $AU15), it's a worthwhile purchase to obtain 4 TGV trainsets which naturally fit in with the high speed requirements of the LGV Med. You can bypass the use of the TGV Addon trainsets in the default activities (see Eurostar on LGV Med and Thalys on LGV Med) but the activities below use various trainsets from the TGV Addon. You'll also see that the activities below need various freeware rolling stock and the sites from which to download these are given. In the main, from this side of the world, it's been easier to download from the Train-sim.com file library, if that choice is available, than from an author's European site. If you want to try to substitute player consists with freeware TGV trainsets, you'll probably find the time consumed in doing so is outweighed by the simple purchase of the TGV Addon packs. Then there are the loose consists which ConBuilder can only check on but not enable you to exchange for rolling stock in your roundhouse. Perhaps the Activity Editor would help out here (not yet having a suitable monitor, webTrainSim can't verify one way or the other) but that's valuable time taken away from driving! TGV Duplex TGVDuplexV2.2.exe (11.4Mb) from www.depot-train.fr.st. Features include random radio message announcements or the loco bell from the Bell key. Note the TGV Duplex trainset won't install if you've already got Chris Longhurst's Eurostar in its own sub-folder, Eurostar, under the Trainset folder. So if you want to have both the TGV Duplex and the Eurostar, you'll need to do some work to make several changes to folders, file names and so on to keep MSTS happy. We're not far from Avignon having departed Marseilles for Nimes. No extra rolling stock is required. If you want to be able to drive at speeds up to 300kmh, you'll need to change the Acela's default ENGine file; the author has included one in the download file. If you're happy to edit ENGine files with WordPad or other Unicode text format editor, you can make the changes yourself to MaxSpeed and in the OverSpeedMonitor section. webTrainSim didn't bother with the Acela and used ConBuilder to change the activity's consists to the Eurostar trainset. Another alternative is to substitute the Thalys trainset in place of the Acela. Download lgvacel.zip (28kb, 11-Aug-02) from the LGV Med Route activities page. The viaducts at Triangle des Angles. 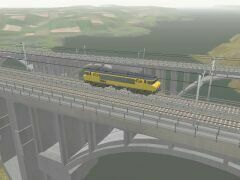 This activity requires the Speedworks TGV trainset pack as well as the rolling stock below; some of these you will have downloaded for TGV1 - First run and TGV2 - Return with Thalys. 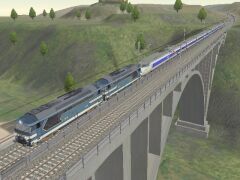 Download tgv-nice.zip (51kb, 10-Aug-02) from Train-Sim.com file library or LGV Med Route activities page. Our pair of BB6700s are coupled to the stranded TGV on Viaduc de Ventabren. The Speedworks TGV trainsets are required, as well as the following (some of which you may already have if you've run the activies above). At first glance of the contents of the zip file, you may wonder what's going on! Apart from the necessary ACTivity file, PATh files, and so on, there is an instruction to run a batch file and there are a number of WAGon files in the zip. Rather than using WinZip's extract facility to place files in the folders as given in the zip file, webTrainSim extracted files to the required folders opened in Explorer by the drag and drop method. The final job was to manually copy the *.ACE, *.S and *.SD files from ...\Trainset\TGV_531_V1\ to a newly created folder ...\Trainset\TGV Secours\ (note the space between TGV and Secours). Sort these files by clicking the Type column in Explorer to make the copy process a bit easier. As a general rule, webTrainSim doesn't like spaces in a loco or wagon folder name. In this case, if you look through the ACTivity file and check the loose consists, the folder name is enclosed in quotes so in this case MSTS should behave itself. Download secoursTGV.zip (31kb, 11-Aug-02) from LGV Med Route activities page. The 67000s have a 120 km/h speed limitation. When driving with head out, remove your hat and watch for approaching TGVs. As you are approaching the TGV, you will have to stop in front of a red signal (not the one with an 80 kmh speed restriction, the next one). To pass this signal, you must obtain an authorization (use the Tab key). Once coupled to the TGV, remain in reverse and push it towards Nimes. Stop and move forward after the dispatcher switches the line ahead (the little hook on the track monitor disappears).